As a writer of fantasy, I am fascinated with dragons. Power, wisdom, strength - these are words that come to my mind when I think about dragons. Pathetic and comic aren't words I normally associate with them, but sometimes they are appropriate. I have a large collection of dragons that I'd like to share with you. 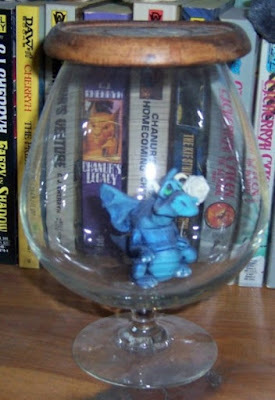 This little gentleman is trapped inside a brandy snifter. He doesn't look terribly pleased with his accommodations.